Explore Scientific O-III Nebula Filter 1.25"
Observing difficult, dim Deep Sky targets like Planetary Nebulae and certain supernovae remnants, such as the Veil Nebula in Cygnus from light poluted environments can be a very tricky business. This is where the Explore Scientific 1.25" O-III Nebula Filter shows its strengths. By isolating light on the 450-500nm lines, this filter enables the user to see certain objects isolated from background skyglow in glorious detail. Planetary nebulae are a particular forte of the Explore Scientific 1.25" O-III Nebula Filter - major objects like the Ring Nebula and the Dumbell are enhanced tremendously and certain more obscure objects are revealed in situations where they were previously invisible. 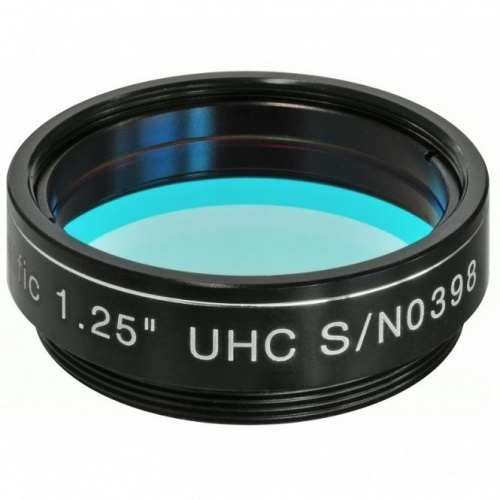 Although this filter works best in reflectors of the 150mm/6-inch class and the 80mm/3-inch class of refractor and above, this filter will enhance views through telescopes of any size for these specific objects. However, it is when viewing the Veil Nebula that the OIII really shines. From light poluted environments, the Veil is invisible - when the Explore Scientific 1.25" O-III Nebula Filter is deployed, it reveals itself as if by magic! The Explore Scientific 1.25" O-III Nebula Filter fits all standard 1.25" eyepieces and accessories via its 1.25" thread and comes in an attractive presentation box. 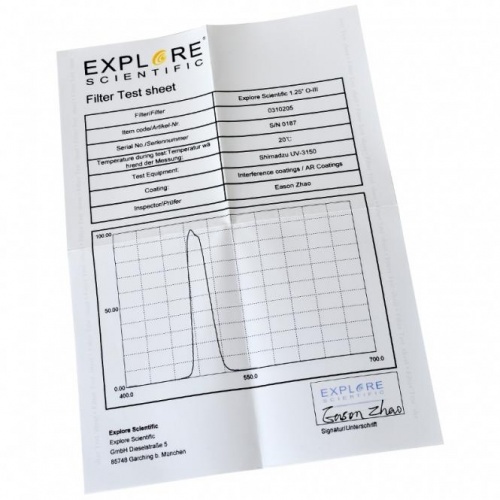 A unique selling point of the Explore Scientific range of filters is that each individual filter comes with a test report and certificate to ensure the utmost quality. Each filter is individually serial numbered and the certificate pertains exactly to this unique number. Explore Scientific UHC Nebula Filter 1.25"
Explore Scientific CLS Nebula Filter 1.25"